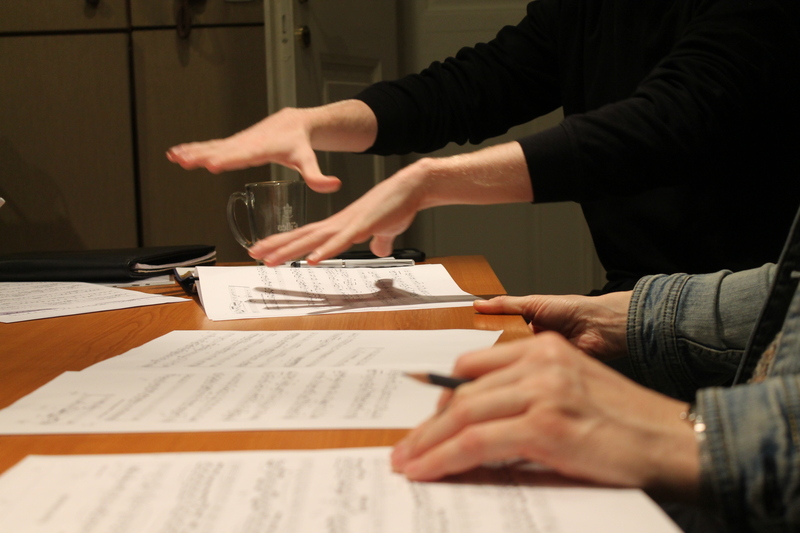 When Ericsson Hatfield came to NYU Prague in 2015 as a sophomore to study music, he didn’t expect that one year later, he would return to Prague to have his compositions professionally performed and recorded by his former professor. But that is exactly where his studies in the NYU Prague music program led him. 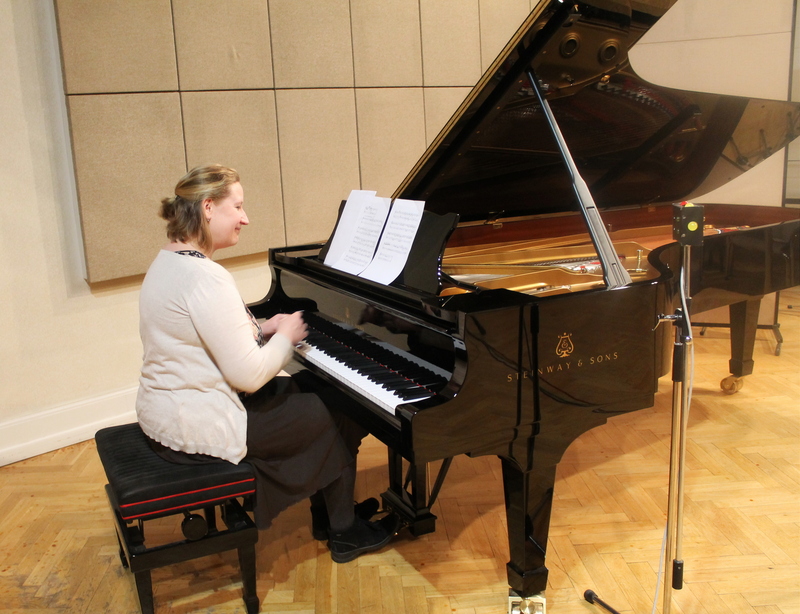 While in Prague Ericsson (Steindhardt, 2018), a student of violin and composition, studied piano with Dr. Petra Matejova, an award-winning Czech pianist specializing in early music and fortepiano playing. When Ericsson presented one of his compositions to her during a class, she offered to play it at the music students’ recital. 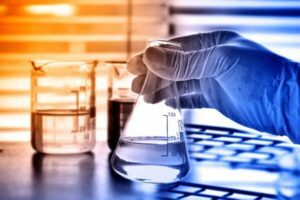 “In the USA this would never happen – professors are much more separated from their students, and you have to pay a lot of money to have a professional play a new piece,” Ericsson explained. Their collaboration did not end with the recital and Ericsson’s return to the US. 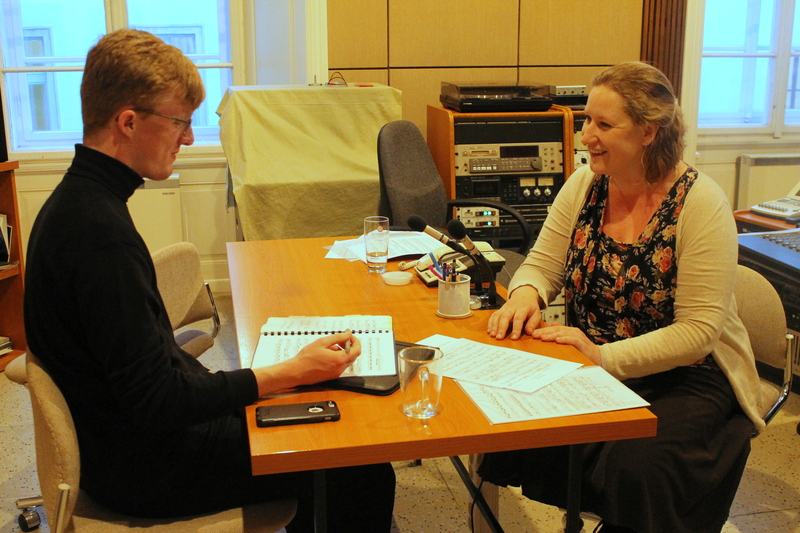 They stayed in touch by email, with Ericsson writing new pieces inspired by Petra’s specialization in early music and Petra offering technical advice. “Ericsson specializes in a style of music – Baroque – that is rare for a 20 year old. I have met very few people who could write fugues in this form – and he does it very well,” she said. When NYU’s Tonemeisters started planning a trip to Prague for the summer of 2016 during which they would make sound recordings in different spaces in the city, Petra suggested that they use Ericsson’s compositions – resulting in the first professional recordings of Ericsson’s pieces. When the Tonemeister’s recordings were successful, Petra and Ericsson decided they wanted to record more – enough for a first album. 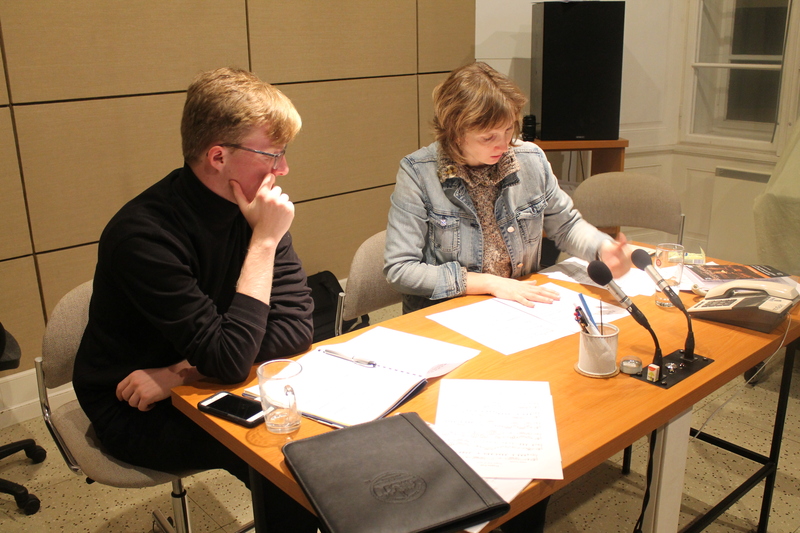 Thanks to a crowdfunding campaign, Ericsson could cover the costs associated with recording his new pieces in Prague, including his airfare and the studio. 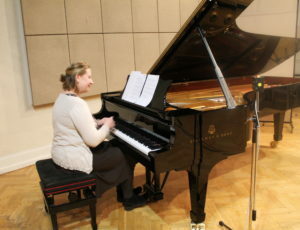 This past January, Petra and Ericsson rehearsed new pieces. When finished, the album will be posted on iTunes and submitted for consideration on streaming services. 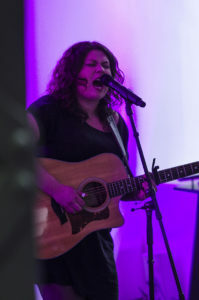 Ericsson, who is from Palm Beach, Florida has also been discussing the possibilities of holding a public concert at the local arts center to celebrate the release of the album. He hopes that if the event occurs, they could also raise enough funds to invite Petra to perform at the event. This piece was written by Leah Gaffen of NYU Prague. 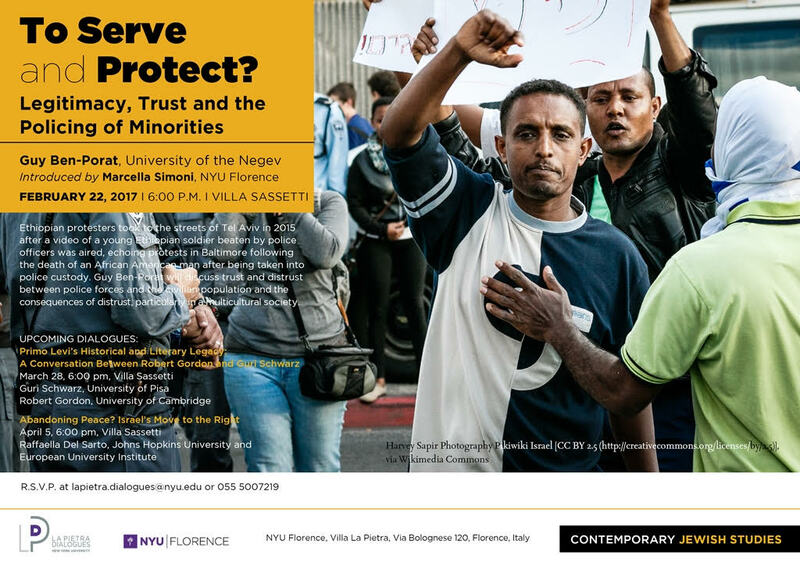 On 22 February, NYU Florence will host an event entitled To Serve and Protect? Legitimacy, Trust and the Policing of Minorities. Professor Guy Ben-Porat of University of the Negev will speak, after being introduced by Marcella Simoni of NYU Florence. Ethiopian protesters took to the streets of Tel Aviv in 2015 after a video of a young Ethiopian soldier beaten by police officers was aired, echoing protests in Baltimore following the death of an African American man after being taken into police custody. 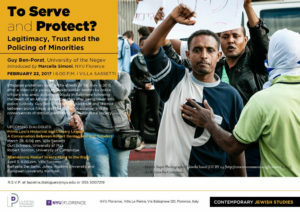 Guy Ben-Porat will discuss trust and distrust between police forces and the civilian population and the consequences of distrust, particularly in a multicultural society. There are also a number of upcoming related dialogues at NYU Florence: Primo Levi’s Historical and Literary Legacy: A Conversation Between Robert Gordon and Guri Schwarz March 28, 6:00 pm, Villa Sassetti Guri Schwarz, University of Pisa Robert Gordon, University of Cambridge and Abandoning Peace? Israel’s Move to the Right April 5, 6:00 pm, Villa Sassetti Raffaella Del Sarto, Johns Hopkins University and European University Institute. 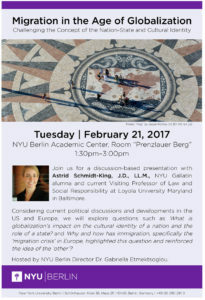 On Tuesday February 21, NYU Berlin will host an event entitled Migration in the Age of Globalization Challenging the Concept of the Nation-State and Cultural Identity. It will be held 1:30 – 3:00 pm at the NYU Berlin Academic Center, Room Prenzlauer Berg. Moderated by NYU Berlin Director Dr. Gabriella Etmektsoglou, this will be a discussion-based presentation with Astrid Schmidt-King, J.D., LL.M., NYU Gallatin alumna and current Visiting Professor of Law and Social Responsibility at Loyola University Maryland in Baltimore. Considering current political discussions and developments in the US and Europe, the event will explore questions such as What is globalization’s impact on the cultural identity of a nation and the role of a state? and Why and how has immigration, specifically the ‘migration crisis’ in Europe, highlighted this question and reinforced the idea of the ‘other’? For her pursuit of teaching excellence and cultural understanding, Assistant Professor of History Heather Ruth Lee of NYU Shanghai was conferred the prestigious Martin Luther King, Jr. Faculty Award on February 7, as part of a cherished tradition at the NYU community — the annual MLK Week. The award, sponsored by the Provost of NYU, recognizes outstanding faculty who exemplify the spirit of Dr. Martin Luther King, Jr. through leadership, social justice activism and community building. The winners have all made a positive impact within the classroom and in the greater NYU community. Tuesday’s award ceremony at NYU Kimmel Center saw Professor Lee — joined by four other winning faculty, past winners and university leadership–giving an emotional and inspiring acceptance speech, in which she recalled a deceased friend who dedicated her life as an undocumented immigrant to political activism for equality. Recipients of the Martin Luther King, Jr. award are selected by a committee of previous winners and a student leader, based on essays about faculty candidates authored by student nominees. In her letter nominating Professor Lee, NYU Shanghai sophomore Chelsea Polanco recalled a “memorable moment” in which the professor met criticism from another student in a talk about the burkini ban in France. According to NYU Shanghai Provost Joanna Waley-Cohen, Professor Lee brought attention to issues of cross-cultural misunderstanding and encouraged students to air their differences without fear of retribution. “We are proud that she has won the award and grateful for her leadership. At NYU Shanghai, learning to build community and function in a multicultural context is part of our DNA,” she added. This post comes from NYU Shanghai and is available here. 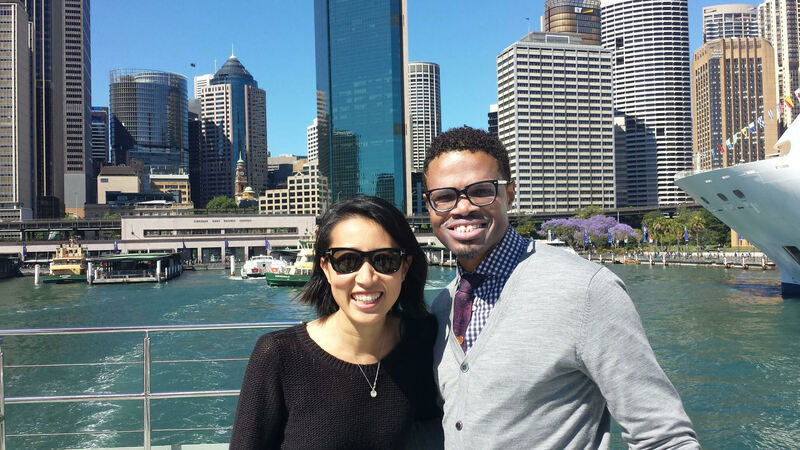 Monroe France with Yuri Ogura, Academic Programs Coordinator at NYU Sydney at Sydney Harbour. 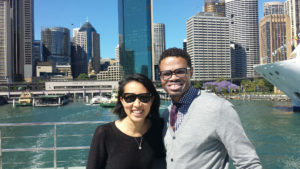 Late last year, NYU Sydney faculty met with visitor Monroe France, Associate Vice President for Student Affairs & Diversity Initiatives. 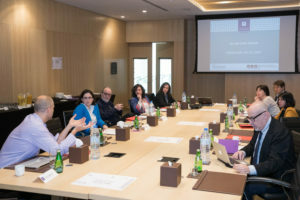 The meeting was the keystone event of Monroe’s invaluable trip to the Sydney campus, augmenting what had already been a jam-packed week of professional development experiences for administrative staff and informal engagements with students. Monroe provided staff with some base tools in order to identify microaggressions along with strategies to practice allyship. Concerns raised during a 2015 Town Hall event acted as a catalyst for NYU Sydney’s administrative team to apply for CMEP’s Global Diversity and Professional Development Grant. Eager to learn more about the experiences of minority students within the NYU community, the team lodged a request to learn more about ways to support students of colour and how social movements are affecting change on college campuses throughout the United States. Faculty relished the opportunity to engage with Monroe, requesting the seminar focus on the efforts NYU is making to address matters of diversity, equity and inclusion. This request was made to discuss and formulate ways in which local instructors can enhance cultural competency and further support NYU’s institutional mission. The training Monroe designed encapsulated themes of social identity, social justice and privilege. These topics were contextualised by a corresponding screening of portions from last year’s listening event. The clips shown of featured students provided a succinct focus on core topics central to the meeting, acting as an icebreaker for local faculty and staff to reflect on these important themes. As the meeting progressed it organically moved towards a discussion of individual teaching experiences and plans for future semesters. The teaching staff were in consensus that future classes should act as an open, safe environment for students to discuss their salient social identity and preferred gender pronouns, a suggestion that Monroe recommended also be integrated into early semester introductions. Arguably the most compelling insight into matters of diversity and inclusion was offered by former NYU-Sydney student Ishani Dugar. The speech, which was performed during one of President Hamilton’s inauguration sessions, revealed misconceptions of universal communities. Ishani discussed original intentions to continue activism while in Sydney only to find that the local LGBTQ community was, although connected in solidarity, focusing on addressing different issues. The message served as a reminder of the nuances that exist between marginalised groups across the globe. 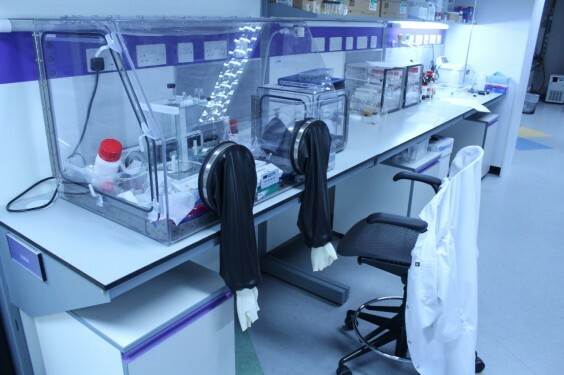 More broadly, the week’s training helped elucidate which groups feel marginalised at an institutional level. Familiar with local systemic oppression within an Australian context faculty were less attuned to the American experience. Monroe discussed student activism at NYU and progressive discourse as a result of the Black Lives Matter movement. As the NYU-Sydney team prepare for future semesters, Monroe’s visit has provided a solid contextual framework to work within. Faculty will be encouraged to select reading materials that help students further interrogate social identity from an Australian perspective. With better understanding of the lenses visiting students employ to understand these issues through, the NYU-Sydney team will endeavour to create supportive environments and further opportunities for the examination of social identities from a global perspective. Today we are in conversation with Kate Yeager, who studied at NYU Berlin for the fall semester of 2016. I am a student at The Clive Davis Institute of Recorded Music in Tisch majoring in Recorded Music as a Junior. What inspired you to study in Berlin? My program was moving to make Berlin mandatory for all students. I always wanted to study abroad in either Prague or London, so I decided this was the best fit for me as a transfer because it was giving me both the experience of studying away while maintaining my the push of my curriculum. My experience was every bit inspiring, surprising and moving. The history is what really did it for me. Every day, Germans walk on the street and are faced with their history– A constant reminder of a really troubled past and how it shaped who they are today. 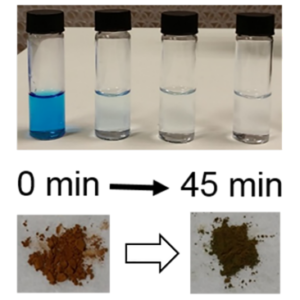 The ability to experiment out of this is incredible. It’s the idea that the abundance of cheap space and abandoned space gives. Like after the wall fell, everyone was on a search for interesting spaces to express themselves without judgement. “Oh there is an abandoned Nazi bunker…let’s turn it into queer night club.” Now that bunker holds the most incredible private art collection I’ve ever seen, while still maintaining its history as one can see the graffiti inside from the bunkers club era. The mentality of creation is invaluable there. It is truly priceless. It’s a constant search to make somethings and everythings and to make a place where you can loose yourself, or find yourself, or be yourself. It’s a special mentality. It was challenging for me to do music in Berlin because of the varying genre popularity. In New York, I can pretty much go everywhere with my guitar and I and be fine. The majority of people aren’t seeking out singer-songwriters in Berlin, they’re seeking out techno, which is wholeheartedly fine. That was genre the city was built on and I am not trying to change the places I go, just try to hold hands with the places I’m with. But I did grow incredibly found of the folks I met in the open mic circuit in Berlin. I will never forget them, they have given me some of the best nights of my life. I understand that you are a singer-songwriter and that you developed new content while in Berlin. Did your experience studying at NYU Berlin influence this content and your work? Absolutely. I absorbed as much as I could while I was there. Both feeling submerged in one culture and isolated from my own. It’s a polarizing feeling that contributed to a lot of creative moments. I got to experience spaces I never thought I would like attending music festivals and recording sessions at Funkhaus, to recording at Red Bull Music Studios to going to a concert at my favorite artists house since I was 12 years old. These things change you and the way you work and create. I write about people, places, and things– nouns if you will, and when all of that changes, so does all of the vocabulary around those things. So it becomes an entirely new vernacular to work with. Were you able to perform while in Berlin? How did being there influence your development as an artist? I was. 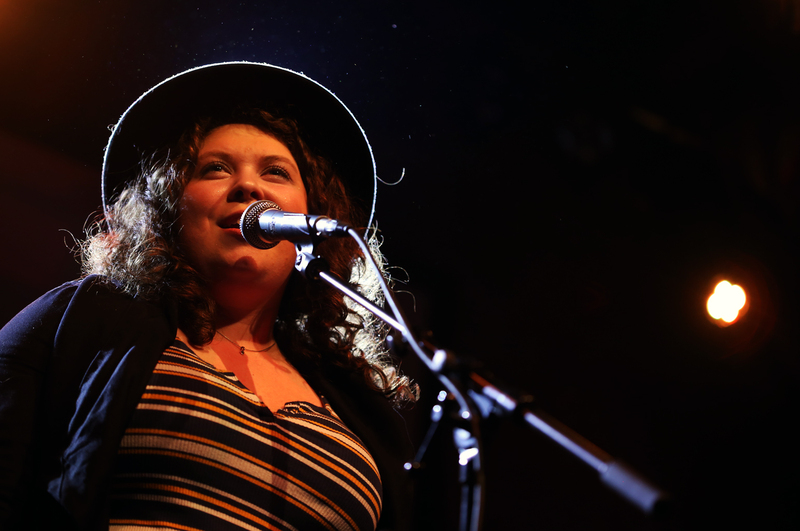 I was truly lucky to be able to perform in Berlin. I had a couple of solo shows. 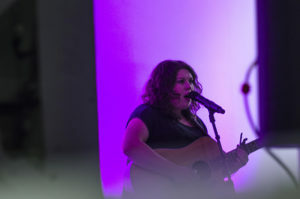 I played a Sofar Sounds while I was out there and got to perform in other countries in Europe. Well for Germany in particular, I was able to experiment more. It turned from, I am Kate the girl with an acoustic guitar to, let’s try these electronics and this effect on my instrumentation here. Let’s really see how to make this music mine. It pushes you and its accessible there. Time away makes you find a different part of yourself and your artistry. Do you feel as though you were able to engage with Berlin’s artistic community, explore the city’s cultural landscape, and connect with local artists? Yes and no. I was such a lucky person to as submerged as I was in the local community and cultural landscape. When I entered the open mic circuit, they truly welcomed me with open arms as they literal brought me into their homes and hearts. I drank whiskey with people from 5 different countries and a couple of locals as we talked about queerness and politics and art. We all wound up in Berlin for the creative prospects. Berlin is a hub for artistic people and being welcomed into that environment by people who have been there far longer than I have was so special. No, because that was a very specific subculture of Berlin’s landscape. I am not an electronic artist and that is such a big part of the culture there, that I didn’t get to connect with local artists involved in that world on the same level as I did with other non-electronic musicians. How do you feel your experience performing complemented your academic experience at NYU Berlin? I was really lucky that sometimes the two over lapped. I was able to perform at places like Machinenhaus and the Hamburgerbanhof because of Recorded Music performance workshops. Hamburgerbanhof is such an iconic place in Berlin and I would have never thought to play there if not for the NYU Berlin team. Has your time studying at NYU Berlin, your experiences there, or the content you developed there informed your thinking about your future plans? If so, how? When I was gone I travelled to over 14 cities and 10 countries. The most important take away from traveling and living that much in other areas of the world, is how vital the music culture is to me when picking a future place to live. I can’t be in a place that doesn’t embrace music. It’s so vital in locations like Berlin and Dublin, that when I go there I feel the pulse of the city through the music. I can’t really say if its effect my future plans. My google calendar only goes so far, but it definitely has and will inform my choices in the future. To be in a completely different music industry, however, made me realize how different cultures care for music. That will inform the way I carry myself back in the states always. Is there anything else you’d like to share about your time in Berlin or while at NYU? I grew up on a tree farm, so never in my life did I think I was going to live in Berlin. It is a time in my life where I learned a new level of creativity, responsibility, and independence and I am really excited to let that come through all the new music and projects coming up this year. On Saturday, February 4, NYU Washington, DC and the Society of Environmental Journalists presented a mini conference, The Trump Administration and the Environment: A Reporter’s Primer, to discuss water and energy issues, EPA policies, environmental advocacy and public opinion in the new Trump Administration. Speakers included Myron Ebell, the head of the Trump transition team for EPA; Scott Segal, a fossil fuels industry attorney for Bracewell; Bob Perciasepe, Center for Climate & Energy Solutions and former Obama and Clinton EPA appointee; and a panel of reporters who have covered Donald Trump and his appointees to head EPA and the Department of Energy.